Situated on Spain’s south coast, right in the heart of the Costa del Sol, Marbella lies roughly halfway between Málaga and Gibraltar. Bordering the Mediterranean Sea to the south, it is protected by several majestic mountain ranges to its north, among the Unesco bio reserve of the ‘Sierra de la Nieves’, and the characteristic La Concha (shell mountain), itself part of the Sierra Blanca range. The centre of Marbella and the Golden Mile, which connects the town centre with Puerto Banús, lies between Mediterranean beaches and the mountains to which the region thanks its warm, gentle climate. The area around Marbella has been inhabited since the earliest of times. The original Iberian population was later colonised by Phoenicians, Romans and Moors, who have all left their traces. Marbella’s glamorous lifestyle dates back to the 1950s, when the then fishing village was discovered by the international jet set of the day. Lots of famous celebrities, among them Omar Sharif, Sean Connery and Liza Minelli, became regulars and soon Marbella was synonymous with elegance and glamour. While the region is still a favourite of international stars, aristocrats and millionaires it is no longer the exclusive preserve of the super-rich. Since the 1990s professional families have been settling here, using Marbella as a base from which to work, live, travel to other parts of Europe and raise their children. They are drawn, above all, by the gorgeous climate and the quality of life that this ideal corner of Europe can offer. The Costa del Sol enjoys a pleasant Mediterranean climate, marked by long, dry and hot summers with short, mild and frost-free winters. Even within this benign environment Marbella is recognised as heavy a particularly favourable microclimate, something it owes to its setting between sea and mountains. The unique local conditions that ensue produce stable, sunny weather with soft, refreshing breezes in summer and exceptionally mild winters. As a result, Marbella’s climate is officially regarded as one of the finest in the world – with few if any equals in Europe. The area boasts some 320 sunny days a year, great weather variations are rare and even at night temperatures are conducive to an outdoor lifestyle. In all, it makes for a way of life that is relaxed and focused on outdoor living, so you can indulge yourself regardless of whether you wish to dine, shop, sunbathe or play sports in the open air. Not surprisingly, most apartments and villas are designed with spacious terraces, green areas and swimming pools. Along the 26-kilometre long coast you will also find chiringuitos (beach cabana bars), luxury resort hotels and beach clubs, as well as hundreds of international restaurants and dozens of beautifully located golf clubs and sports centres, many with their own restaurants and spas. Ensconced between the various golf courses are the apartment urbanisations and also the luxury villa suburbs that Marbella is renowned for. The list of international celebrities who own homes here or visit regularly is too long to mention, but includes the likes of Prince Albert of Monaco, Rod Stewart and Max Clifford. Set within lush subtropical gardens, many of these villas enjoy spectacular views along the golf courses and coastline to the unmistakable Rock of Gibraltar and the North African coast across the Mediterranean. The people who live here call Marbella a large village because although it has the facilities of a large city – with international schools, luxury shopping centres, clinics and a wide array of professional services – Marbella has retained the safe and intimate yet cosmopolitan ambience of old. Andalusians are known for their warmth and hospitality. Theirs is a proud people, faithful to their traditions, the good life and the annual ferias (fairs) that vary in character from village to village. The population is made up of locals and people from other parts of Spain and Europe who have settled here or own a holiday home. For many people it is above all the free and easygoing lifestyle that is so attractive about this area. Endowed with a rich culture and history, Andalucía is a veritable treasure trove of fascinating cities, monuments and sights, with stunning natural regions to boot. The Costa del Sol itself is a popular tourist destination that attracts a year-round clientele thanks to its climate, beaches, golf clubs, luxury hotels, trendy beach clubs and bustling nightlife. Most residential areas are located along the coast and up to the foothills of the nearby mountain ranges, with golf courses and other attractions in-between. Marbella’s town centre, meanwhile, is divided by a long shopping boulevard flanked by famous brand boutiques. The area between here and the beaches is a lively mix of cafés, restaurants, bars and hotels, with the beachside esplanade and the marble Avenida del Mar – famous for its statues of Salvador Dalí – as the focal points. Venture north of the main avenue and you see a very different side to Marbella, for here, ensconced within centuries-old town walls lies the historic quarter, with its charming maze of monuments, streets and squares lined with typical shops, tapas bars and restaurants. Marbella is connected to the famous yacht harbour of Puerto Banús by the Golden Mile, a six-kilometre long road that runs through some of the most exclusive real estate in Europe, many belonging to aristocrats and sheiks. You could, however, also follow the pedestrian and cycling path that follows the coastline from Marbella to Puerto Banús, with its designer boutiques, nightclubs and restaurants overlooking a harbour full of super yachts and luxury cars. Several kilometres past Puerto Banús lays San Pedro, a typical Spanish village within Marbella’s municipal boundaries. Authentic and lively, it counts many traditional Andalusian restaurants and shops, as well as a modern high street and several beach clubs. Further west Marbella borders the municipalities of Estepona and Benahavis. 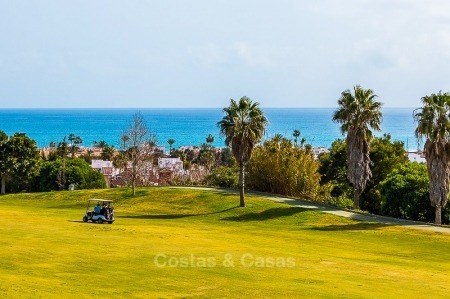 The coastal strip between Marbella and Estepona has been dubbed ‘The New Golden Mile’ because of its golf courses and a collection of luxurious urbanisations. Benahavis is a small mountain village some eight kilometres inland from San Pedro. Although this pretty white village lies in a peaceful green valley the municipal area itself covers a large area, with luxurious villa suburbs that flow seamlessly into Marbella itself. This area is also home to the most exclusive golf resort and country club in Europe. Whichever part you prefer, Marbella offers a unique way of life thanks to its lovely setting, gorgeous climate and a gentle, cosmopolitan lifestyle that has long since established it as the ultimate destination in Europe.